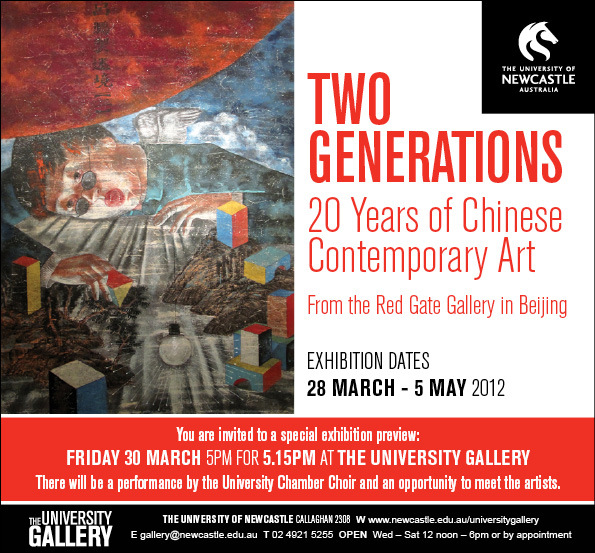 Two Generations – 20 Years of Chinese Contemporary Art touring exhibition and cultural exchange program features the work of 11 of China’s senior contemporary artists from the iconic Red Gate Gallery in Beijing, who have each nominated an emerging artist they admire for inclusion. The works of the two generations of artists were shown side by side to celebrate the achievement of one generation and the promise of the next. This eclectic exhibition showcased a diverse range and medium of work reflecting the dynamic and ever-evolving Chinese art scene and included paintings, works on paper, photography, sculpture, video and installation. 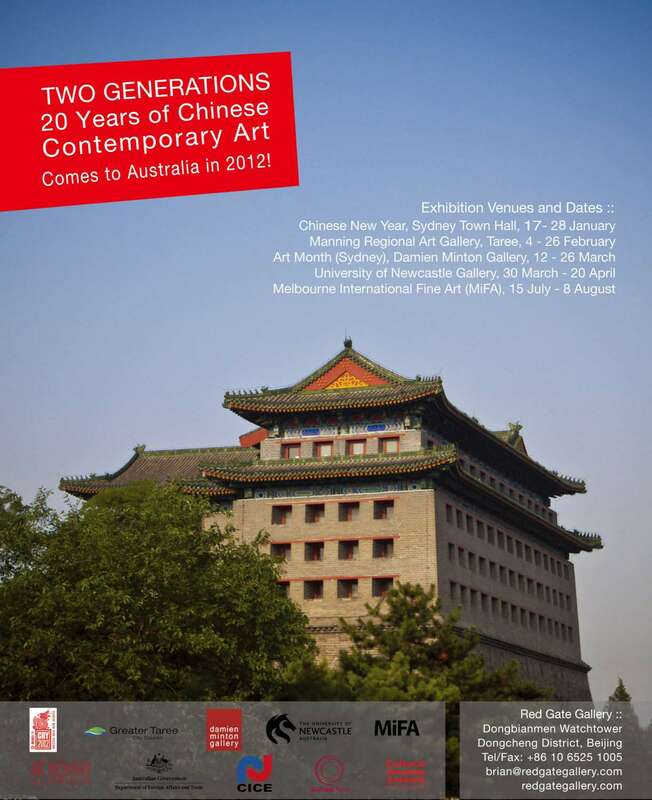 The Chinese Ministry of Culture provided assistance to bring Two Generations to Australia and included the touring exhibition in the official program for Experience China – The Year of Chinese Culture in Australia. In conjunction with the touring exhibition we brought Two Generation artists to attend each of the exhibition openings and participate in public forums and ‘Artists Residencies’ planned by our partner organisations and educational institutions during the exhibition period. With the assistance of the Copyright Agency Limited we hosted a number of young Chinese curators to work alongside Catherine Croll in managing each exhibition. The curators were introduced to gallery directors and established, emerging and Indigenous Australia artists with a view to having them hold exhibitions and residencies by Australian artists in China in the future. Senior Red Gate Gallery artists: Chen Qingqing, Guan Wei, Li Gang, Liu Qinghe, Lu Peng, Su Xinping, Tan Ping, Wang Lifeng, Wang Yuping, Zheng Xuewu and Zhou Jirong. 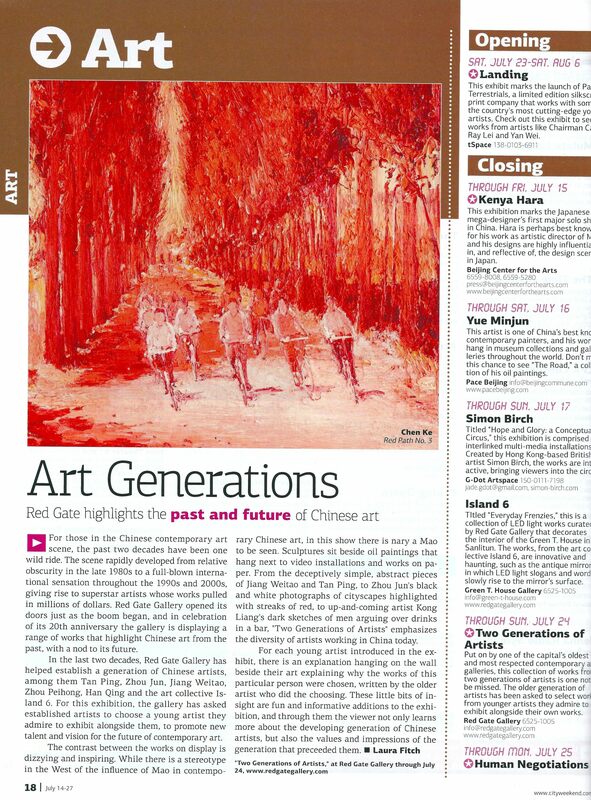 In addition to this we included the next generation of Red Gate Artists – Chen Yufei, Han Qing, Jiang Weitao, Liu Dao, Shi Zhongying, Xie Guoping and Zhou Jun. All of whom have been recipients of the 3 month Red Gate Gallery Chinese Artist Residency, a philanthropic program designed to allow artists from provincial areas to experience the vibrant Beijing art scene. Your support will help to ensure that the Two Generations touring exhibition and cultural exchange program is as comprehensive and accessible as we have planned. You can donate via the ABAF Website.